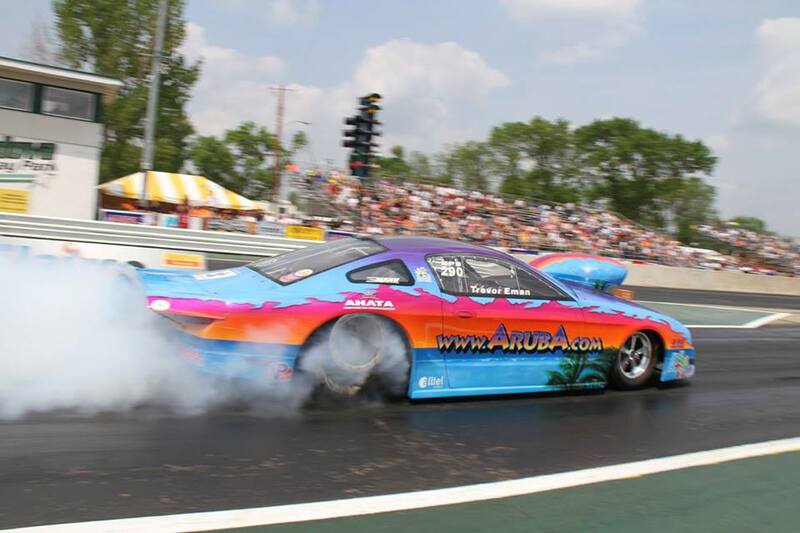 ROCKINGHAM, N.C. September 11, 2014: It’s probably safe to say that of all the PDRA Extreme Pro Stock teams, Team Aruba always has the farthest to travel. As the only international entry, driver Trevor Eman and part of his crew must first fly from their home in Aruba to Charlotte, N.C. before making their way to their Union, S.C. race shop. From there they start leg two of their journey in driving to the event. Last week, it was this second part of the journey that nearly kept them from making it to their home stop on the PDRA tour. The team’s motorhome suffered a major parts breakage that would not be fixable in time to get them to Dragstock XI in Rockingham, N.C.
“Getting to Rockingham was a big struggle,” told Eman. “With the motorhome out of commision, we were unable to leave our shop on the day we wanted to travel to Rockingham. Shawn Scruggs with the Greenville, S.C. based Scruggs Transport and Towing towed our motorhome to a shop, but we were still left without a way to tow our trailer to Rockingham. After having spent some time with Shawn while he was hooking up our motorhome to his tow truck, we discussed the possibility of getting our race trailer to Rockingham, which he was kind enough to offer to help us with. Eman qualified the Aruba.com Mustang in the sixth spot with a 4.126 elapsed time at 175.64 MPH. However, when race day dawned, Mother Nature was the only winner, stealing the show and any hope of eliminations. The remainder of Dragstock will be completed at the upcoming PDRA Championship Finals, October 9-11 at Virginia Motorsports Park. Despite the difficulties incurred over the course of the weekend, Team Aruba was happy to participate in the event, which boasted one of the largest car and spectator counts of the year. The event was even more special for them as they welcomed special guests from Aruba. “With this being the track closest to our hometown location of our race shop in Union, SC, it is also the race that is easiest to get to from Aruba with a straight flight to Charlotte,” Eman explained. “Therefore, we had the pleasure of having both my uncle (father’s brother) and my great uncle join us for this race, after having spent a couple of days with us at our house and shop in Union. After the rain out, Shawn Scruggs transported the Team Aruba race trailer back to their Union shop. “Team Aruba cannot thank Shawn enough for his kindness in helping us get safely to and from the track. If it wasn’t for his help, we would not have been able to even show up in Rockingham. Keep up with Team Aruba on Facebook andTwitter. Find race results, team updates, videos and photos. Also leave your comments to cheer on Team Aruba! For more on your Aruba vacation visitwww.Aruba.com andwww.Destination-Magazines.com.